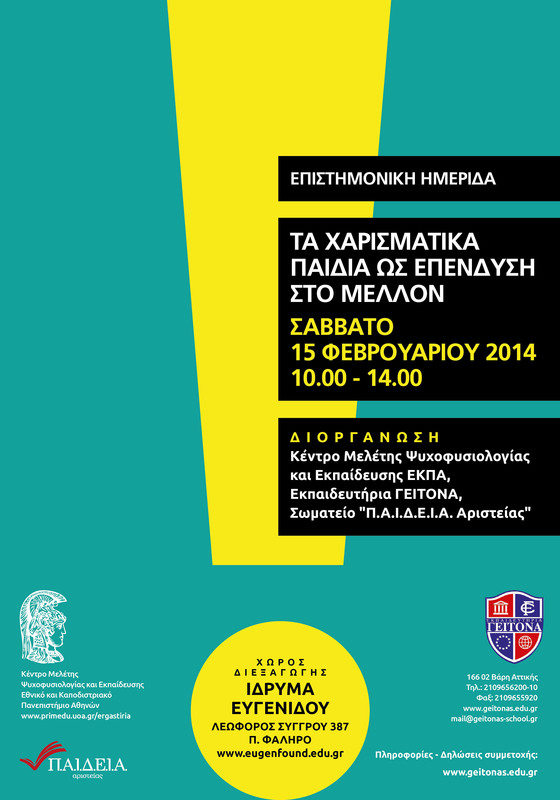 “Education for Excellence”, as part of its activities towards the promotion of the idea of Excellence and the particular needs of talented and gifted children, organised the scientific workshop “Gifted children as an investment for the future”, in collaboration with the Research Centre of Psychophysiology and Education of the University of Athens and the Geitonas School. The workshop took place in the Lecture Hall of the Eugenides Foundation (387 Syngrou Avenue, Palaio Faliro) on 15/02/2014. Its objective was to highlight the special educational and psycho-social needs of gifted children and the necessity for their differentiated education, not only for their own benefit but for the benefit of society. The invited speakers included specialists in the field of education for Excellence and teachers with long experience in the implementation of educational curricula in classrooms of different levels. They presented information on determining the potential of gifted children, their management in the educational process and their social interaction.